I have been pondering what to put into my daughter's Halloween Treat Bags for her friends besides candy. I have been to dollar stores and craft stores and target and have found a few small things. They need to be small to fit in the bag. I am tired of all the pencils and erasers going around. I mean just how many does one household need? Then I wondered about hair bows. Well they sure are not cheap (at least not when you are buying five or six at a time). I wondered if could I make them. And that set me off on another learning quest. I love learning, don't you? I looked at a number of hair bow pictures and liked the ones with those corkscrew ribbons the best. Turns out those are called korker ribbons. Apparently this is very old news to most of the world. But it is new to me so I am sharing my personal new discoveries with you. One does not necessarily just buy korker ribbon, although there are a number of esty and ebay sellers out there. One makes korker ribbon. No ribbon, no hair bow. Turns out making the korker ribbon is pretty easy. First you need some ribbon. I liked this combination of pink, brown and white. These are all 3/8 inch wide. Next you need some wooden dowels cut to 12 inch lengths. The dowels should be 1/4 inch, 3/8 inch, or 5/8 inch in diameter. The smaller the diameter of the dowel the tighter the curl of the ribbon. You also need wooden clothes pins; two per dowel. Start by twisting the end of your ribbon around the dowel a short way then clamp the end in place with the clothes pin. Who ever came up with this method is a genius. Continue to twist your ribbon around the dowel to the other end. You don't really want the ribbon to overlap on itself. And leaving gaps between the ribbon wraps will give you a looser curl. When you get to the end of the dowel, clip the other end with another wooden clothes pin. 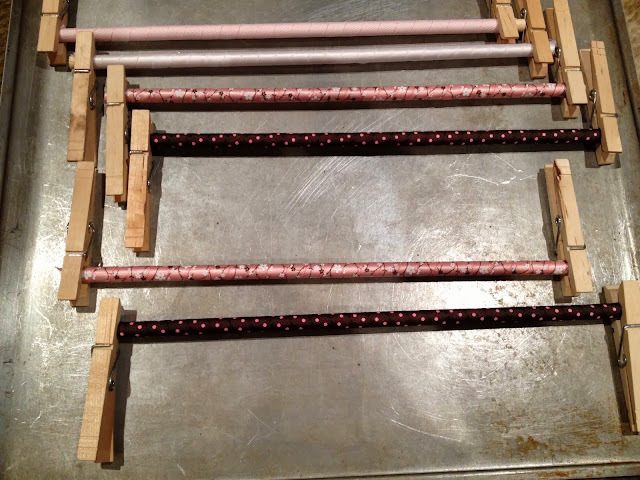 Wrap as many dowels as you have and put them on a cookie sheet. Next they go in a 275 degree oven for 25 minutes. When I first read this I thought someone was making a joke. No joke; go bake that ribbon. I also read that lighter colored ribbon takes more effort to curl than darker ribbon. I found this to be true with the white ribbon which did not take the curl nearly as well as the brown ribbon; but I think it is probably more a function of weave and material rather than color. So for some ribbon that doesn't take the curl right away (like my daughter's hair) you may need to repeat the baking process. Let the ribbon cool between bakings so you don't scorch it. Also, you can try to mist the ribbon before baking to help steam the curl. I also read you can try spray starch then let it air dry. I haven't tried the starch but might give it a go. Once the 25 minutes is up, take the ribbon out of the oven and let cool completely. This really does not take more than a couple of minutes. Watch out for the metal springs on the wooden clothes pins. That metal can hold heat for a long time. Once cooled, take off the clothes pins and slide the ribbon off the dowel. The last step is to seal the ends of the ribbon so that it doesn't fray. I had some FrayBlock on hand from my quilting. But there are many products out there including clear fingernail polish. Remember to seal the ribbon ends for each cut you make. My next trick will be to try to turn this awesome korker ribbon into a hair bow. Wish me luck. I will keep you posted. Ohh so nice thing to make korker ribbon its good time pass in weekend or its good work for housewife for decoration and its in cheap so you can save money for any else thing. I didn't know that either. Thanks for sharing! Well, how fun is this! I'm anxious to see how to make the hair bows! My grandmother used to make all of my bows for me when i was a little girl. I loved that. Thanks for bringing back such good memories, and I am inspired for your passion for teaching yourself something new! Can't wait to see what's next! Visiting from This Momma's Meandering Mondays--thanks for linking up! Wonderful! I just wondered where to buy them :-) 275 degrees meaning Fahrenheit degrees?